Here’s a quick introduction to creating new products in the SellerActive Products Workspace. In this video, you’ll learn how to create a new product from scratch, and how to use existing categorization to create a product. Welcome to the SellerActive video training experience. In this video, I’ll be walking you through the process of creating a new product in the SellerActive Products Workspace. The Products Workspace is designed to pull in your listings from various marketplaces. 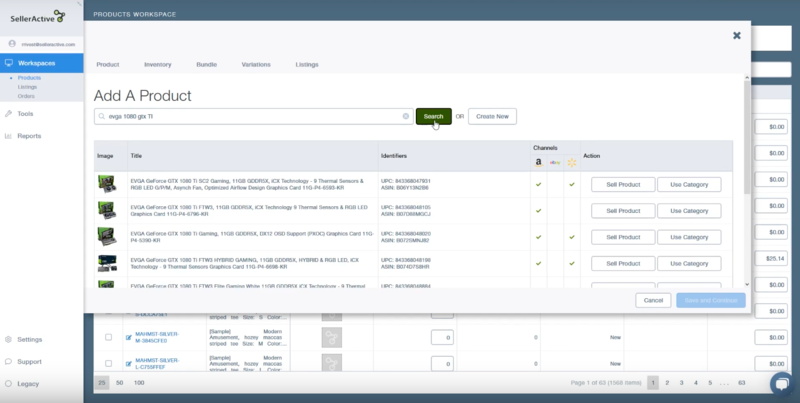 SellerActive stores these listings as unique products in our system, allowing you to manage your entire catalog from one workspace. 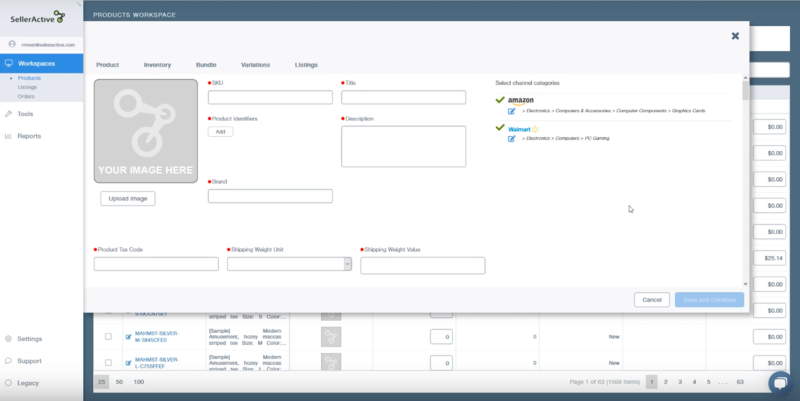 However, if you have a brand-new product that is not currently listed on your channels, we have also designed the Products Workspace to give you a painless product creation workflow. First, please find the navigation pane on the left hand of your screen. Select Workspaces and then Products. 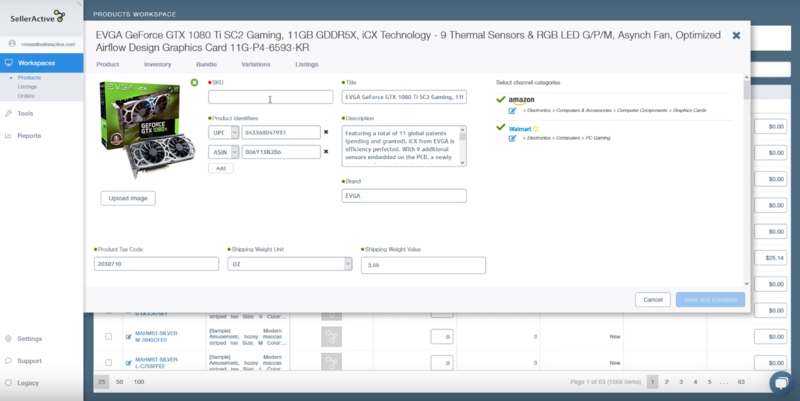 Next, find the “create” option next to “Import” above the product grid. A slide-out pane will appear and prompt you to either “search” for an existing product on the marketplaces, or create a new product completely from scratch. If you choose the search option, you may use the title or a unique product identifier, such as the UPC or ASIN. Our system will then search for the product in Amazon, Walmart and eBay catalogs. A green check mark will indicate which marketplaces the product was found on with the product results in descending order by sales rank. Your next option will be to either “sell” the selected product or use the subcategory of that product to create a new product in our workspaces. If you choose to use the product category, this will allow you the option to create a new product from scratch using the category of the item you recently searched. From here, you will have full discretion over the product details from the basics such as SKU and description, all the way down to optional product information with a host of details to choose from. If you’d rather choose to sell one of the products from the search results, this will auto-populate the listing information from the marketplaces into the products workspace for easy listing access. All that is required from here is to give the product a SKU number before clicking save. You will then have access to the inventory, bundling, variations, and listing tabs for more product refinement options. At this point in the process, you are almost ready to publish the new product out to the various marketplaces. For training on this process, please click on the link at the end of this video, or by visiting the SellerActive knowledge base and search for keyword “publish”. This brings us to the end of this tutorial on creating products. Thanks again for taking part in the SellerActive experience! We’re happy to help, so please do not forget to spend some time in the SellerActive knowledge base.